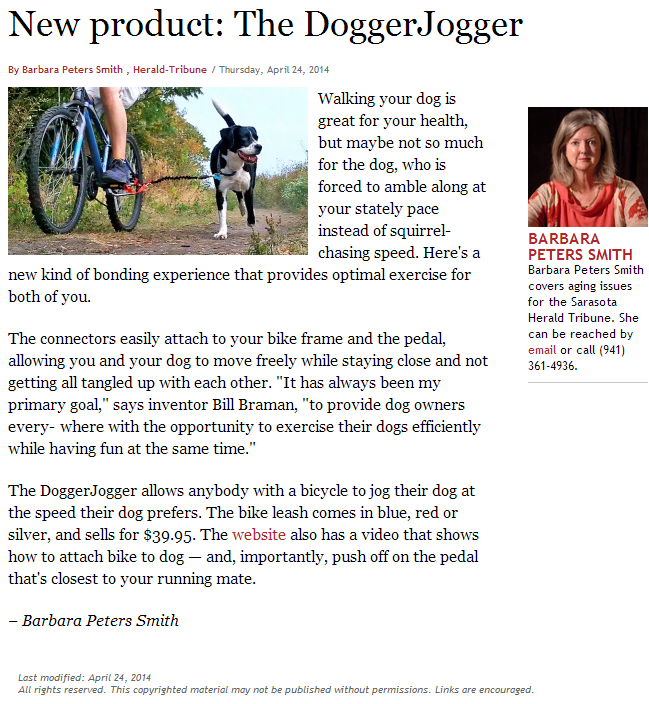 In the June, 2014, edition of Woman’s Day magazine (3.3 million monthly subscribers, 1.7 million unique website visitors), the DoggerJogger is featured as the best way to “Keep Your Dog Fit” if you love to cycle. It’s part of an article which also mentions how to swim, hike or jog with your best 4-legged friend. 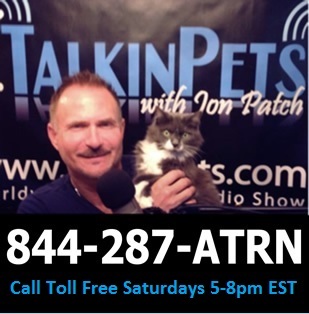 Thank you to Jon Patch for hosting Bill and the DoggerJogger on his show. 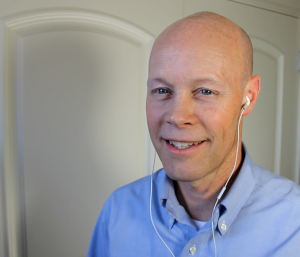 Listen to the show and hear how the DoggerJogger evolved, how it works, where to buy and what to look for in the future! 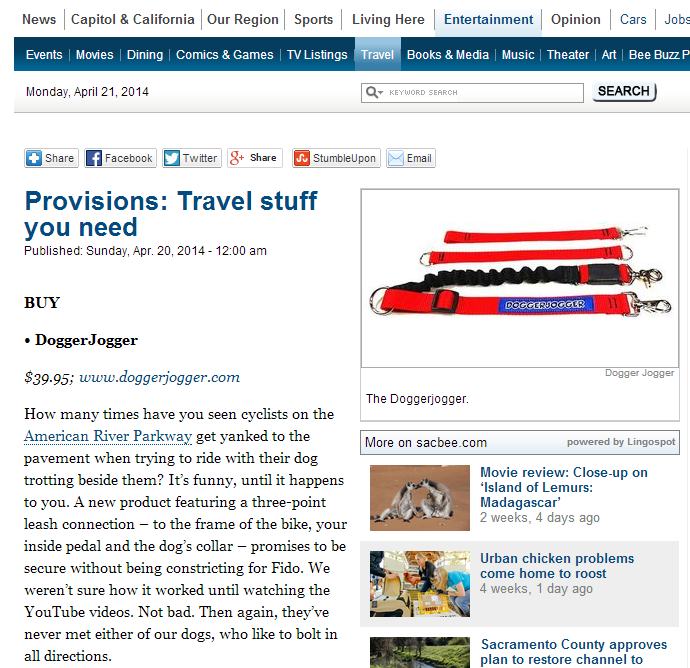 It was really nice of you to mention the DoggerJogger in your article today, “Provisions: Travel stuff you need,” and give it a rating of “not bad.” I guess they say there is no such thing as bad publicity! Did I send you a sample to try with your dogs? If not, I believe you should send me your address so we can get you on your bike and get the dogs running, which would give you the chance to do a full-blown awesome review! I’ll even get you a limited edition t-shirt if you’re a little nicer next time! 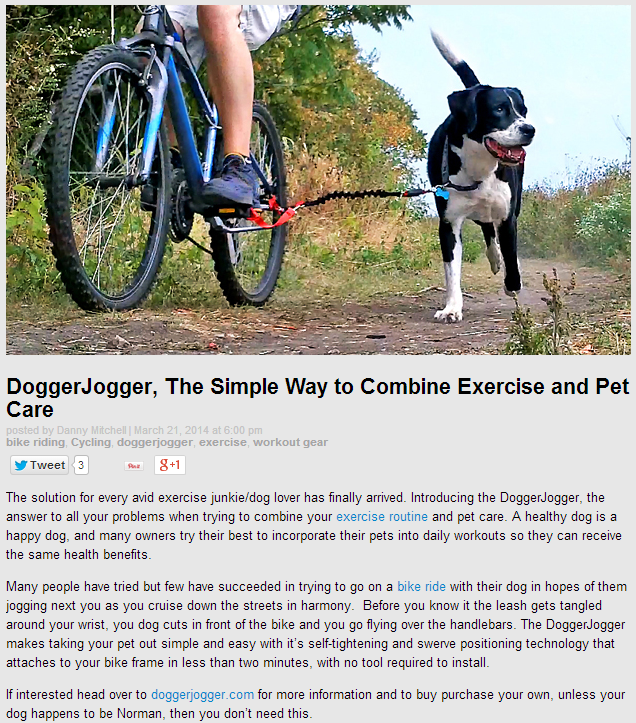 You see, the whole point of the using the DoggerJogger is to allow your dogs to run in the “safety zone” alongside your bike where they won’t be able to “bolt in all directions!” I think it is imperative that you experience the miracle of the DoggerJogger. It lets you take any dog twice as far in half the time! Send me your address and I will set you up. I’m glad you like the YouTube videos, but did you get to the website and watch what is offered on www.doggerjogger.com? There is a great deal of information at our site which would truly complement what you may have learned from the YouTube. 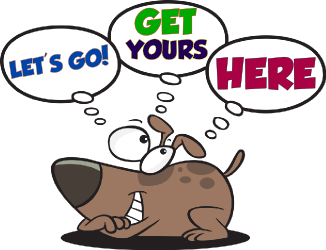 Either way, thanks for spreading the good word of “The Easy Way To Jog Your Dog.” Hope to hear back from you soon! There’s a new dog bike leash for pet owners who want to exercise Fido while riding their bike or jogging. It’s called the DoggerJogger. The light-weight, soft nylon leash is designed to be installed on your bike– without tools — in less than two minutes. It’s “self-tightening and swerve positioning technology” is used to keep your dog in the safety zone alongside your bike. It’s attached low for maximum stability, providing a hands-free exercise experience. And it converts to a walking leash that can fit into a pocket. Bill Braman designed the DoggerJogger after years of tying Fido to his electric skateboard, while weaving past obstacles and maneuvering through pedestrians. He was looking for a better solution for pet owners who want to bike or jog with their pet — something other than the hard-mounted products available, which can be too heavy to lug around. The DoggerJogger weighs about as much as a doggy bag, according to a media release. 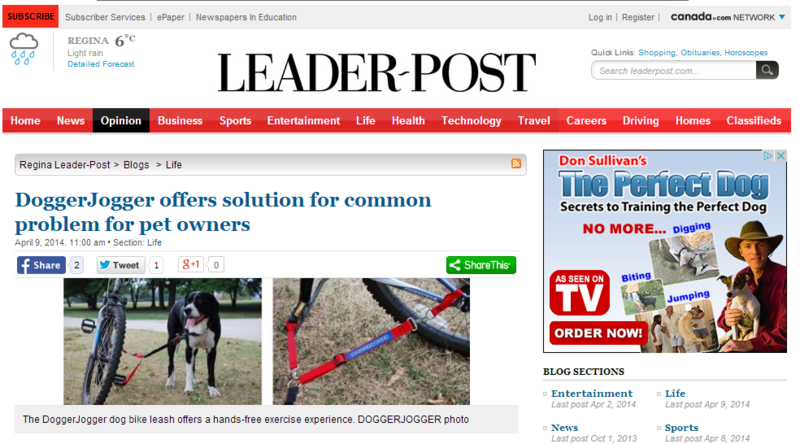 You can purchase the DoggerJogger online at www.doggerjogger.com for $39.95 US. 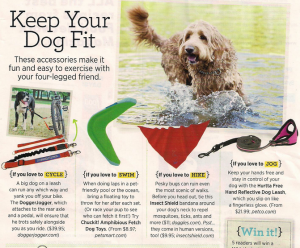 It’s thrilling to see Organic Authority ranked the DoggerJogger #1 on its list of 8 Super Fun Pet Fitness Products! 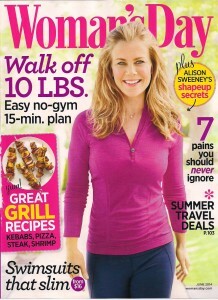 Check out this article! Thanks www.organicauthority.com! With warmer weather just around the corner, I’m not sure who’s more excited – dogs or dog owners. 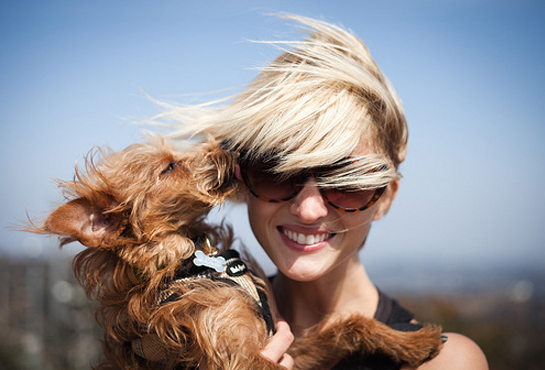 What’s most exciting is the number of ways you can get fit with your pet, no matter your workout or sport of choice. Most products for bikers hard-mount to your bike and weigh too much. You can take DoggerJogger on and off your bike in less than two minutes, it’s super light and is made of soft nylon to protect your bike frame. Best of all, it converts to a walking leash that you can fit in your pocket! Perfect for runners, the BuddySystem Hands Free Leash attaches around your waist and has leash and collar attachments for your pet. It’s designed to move completely around the belt to avoid tangling while you’re mid-stride. We all have goals to get fit, and when we enlist the help of a friend to keep us motivated, everybody wins. Best Fit Friend includes a pair of activity monitors – you wear one and so does your dog. They keep track of the amount of exercise each of you are getting, which you can then wirelessly transfer to your MyFitDog app. It’s a fun way to set fitness goals and build healthy habits together! Using an exercise ball makes for a serious core workout – and the same is true for your pup! Because standing on a round exercise ball causes dogs to balance in an unnatural stance, FitPaws has created the Peanut Exercise Ball that allows them to stand naturally and maintain control. It’s also made of a durable, nail-resistant material. Fun for the whole family, the Doggie Obstacle Course allows your dog to take cues from you, and make his way through an entire obstacle course while racing against the clock. It even includes adorable first, second and third ribbons if you want to invite some friends over! Hiking involves carting oodles of essentials: Water, sunscreen, cell, bug spray, snacks, never mind your dog’s essentials. Now, he can help you carry the load with the EzyDog Summit Backpack. If one of your favorite ways to get fit is through water sports, the Ruffwear K9 Float Coat allows you to take your dog with you. It’s designed for dogs of all shapes and sizes, and gives him a whole new adventure to enjoy – and is perfect for rafting, boating, surfing and paddleboarding. DogTread Dog Treadmills come in four different sizes, and while they’re a little pricey, for avid treadmill users I’d imagine this would be a fun way to include your pet in your workout. It would also be a great way to get fit all year round – especially during those harsh winter months when you both don’t get to spend as much time outdoors as you’d like to. DoggerJogger loves the segment that the “Charlotte Today” Show aired on March 21, 2014, on WCNC in North Carolina. 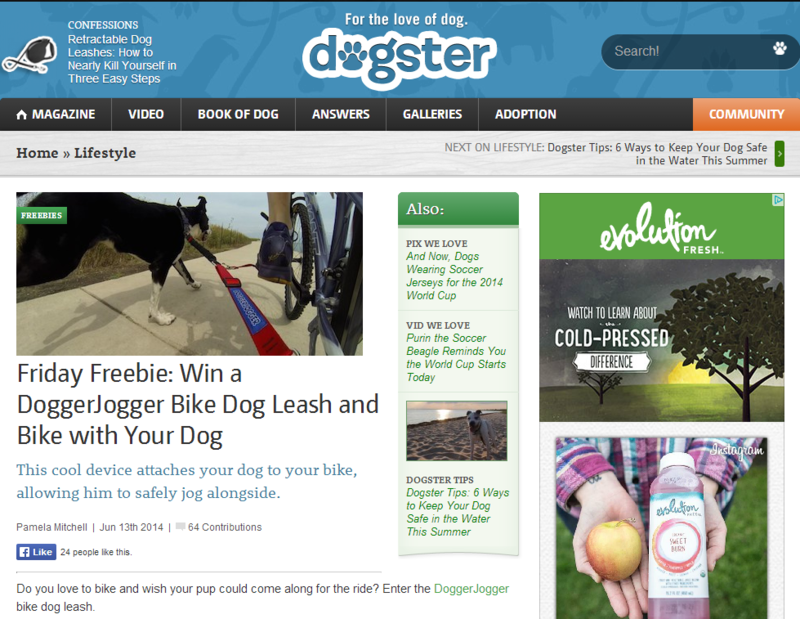 Their segment known as “Cool Stuff Like Soap, Shoes, Flip-Flops and More” featured DoggerJogger as the “more.” You will see the best bike dog leash as the final item displayed at the 2:45 mark of the video. We know it’s the easiest way to jog your dog, now North Carolina knows it, too!